I have a Postgraduate Diploma in Therapeutic Counselling (Cognitive Behavioural Therapy) from the University of Wales. 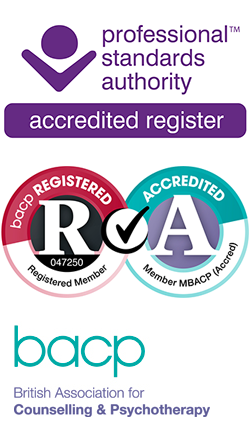 I am an Accredited Member of the British Association of Counsellors and Psychotherapists and abide by their code of ethics and their policies and complaints procedures. I attend a programme of continuing professional development and training to keep fully updated on advances in counselling. As a professional practitioner, I have regular clinical supervision, to enhance my practise and offer external, professional insight. I have worked in Private Practice for a number of years and also for the Local Health Board treating patients suffering Post Traumatic Stress Disorder, using Trauma Focused Cognitive Therapy. I have past experience in several settings such as MIND the mental health charity and in the workplace with government agencies. I have undertaken work for Employee Assistance Programmes (EAP), Private Health Insurance and the Legal profession.